A comprehensive knowledge of laser systems and nonlaser treatment modalities, including light, radiofrequency, and ultrasonic systems; details and treatment parameters; appropriate patient selection; preoperative and postoperative care; and application of new technologies, can produce aesthetic results that are satisfactory to both the patient and the surgeon. Before any intervention, a thorough facial analysis must be undertaken in order to promulgate an appropriate treatment plan. The term resurfacing historically referred to ablative procedures of the epidermis of the skin. 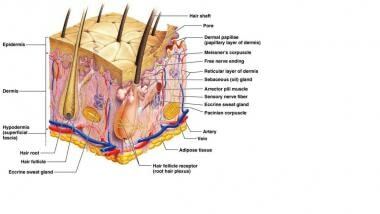 This can also include the anterior-most dermis referred to as the papillary dermis. See the images below. 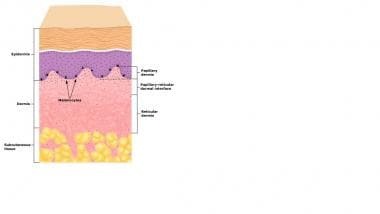 Epidermis and dermis. Courtesy of Primary Care Dermatology Society (PCDS) (www.pcds.org.uk). Detailed diagram of the skin. Courtesy of Wikispaces (https://showmesomeskin.wikispaces.com/Dermis). The term resurfacing was most often used in conjunction with use of the carbon dioxide laser, then the erbium: yttrium-aluminum-garnet (Er:YAG) laser, and, subsequently, fractionated lasers. Technically, chemical peels, dermabrasion, and, to a lesser extent, microdermabrasion, among other treatments, could also be considered resurfacing. Current terminology encompassing resurfacing not only includes ablative, but also fractional, nonablative, and sublative, which further stratify modalities of facial resurfacing. With preoperative evaluations, surgeons seek to identify where potential contraindications to laser resurfacing may exist. As with any procedure, a detailed medical and dermatological history with emphasis on wound healing and scar formation is essential. In addition, obtaining a family history of abnormal wound healing, skin disorders, and ethnic background can facilitate an optimal outcome. If the patient has a history of collagen-vascular diseases (eg, lupus, scleroderma, keloid formation) or immunologic abnormalities such as vitiligo, laser treatment may need to be avoided because these conditions can cause problems with healing and can be relative contraindications to laser resurfacing. It is often worthwhile for patients to complete a medical questionnaire and an aesthetic questionnaire to help identify prior or concomitant facial cosmetic treatments. With the widespread use of digital photography, standard lighting and photographing techniques are often used to provide appropriate comparative photos. Simple digital photos provide basic pretreatment and posttreatment documentation. Variability in lighting can influence what is seen, but photography can still be useful. Different imaging systems are available to assist in facial analysis. Standard- and high-definition digital photography are most commonly used to document the state of the facial skin prior to, during the postoperative period, and after completion of treatment. Basic photo management software can provide precomparison and postcomparison photos. Systems such as the Body Pro from Emage Medical include a camera, lighting system, and background to facilitate image capturing. Additional imaging options using blue light, different color light, and polarizing light can also provide information to the patient and practitioner regarding subepithelial skin changes, especially with regard to pigmentation. While these are not absolute requirements, they can be beneficial. An example of an imaging system including both the hardware and software is the VISIA Complexion Analysis System including the VISIA-CR geared for clinical research and the Reveal Imager, a portable device all from Canfield Scientific Inc, or the Image Pro Series from Emage Medical. 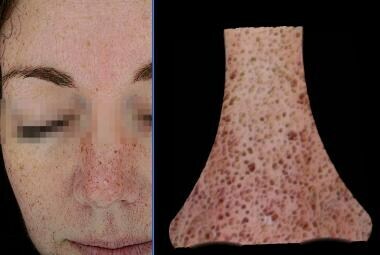 The VISIA Complexion Analysis System uses RBX multispectral imaging incorporating cross-polarized flash and ultraviolet lighting with Canfield’s Intelliflash system to reduce specular reflection emanating from the skin, allowing for assessment of hemoglobin and melanin within the papillary dermis and epidermis, respectively, while providing photodocumentation. See the image below. 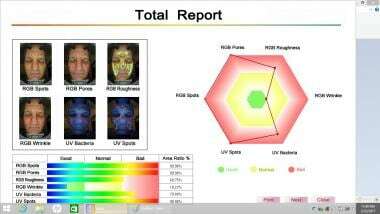 Representative Facial Complexion Analysis from Canfield VISIA System. From left to right: ultraviolet spots, brown spots, and red areas. Courtesy of Canfield Scientific, Inc. (www.canfieldsci.com). The proprietary RBX system allows the melanin and hemoglobin constituents in the skin to be analyzed and presented. This system reportedly gives more accurate representation of the melanin and hemoglobin than what can be obtained with polarizing or ultraviolet filters. The Reveal imager also from Canfield Scientific uses the RBX technology and is postable. See the image below. Schematic flow of RBX analysis and typical red and brown component images: Detected hyperpigmented spots and vascular features are displayed in certain areas. Courtesy of Canfield Scientific, Inc. (www.canfieldsci.com). The Image Pro II uses a 15.1-megapixel display incorporating Emage Medical Triple Spectral Imaging capability, which uses normal, polarized, and ultraviolet light, providing on-screen analysis including measurements, wrinkles, pores, sebum, moisture, vascularity, and both superficial and deep pigmentation. See the images below. Emage Medical Image Pro II normal (left) and ultraviolet (right) photos. Courtesy of Emage Medical (www.EmageMedical.com). Emage Medical Image Pro II normal (left), polarized (middle), and ultraviolet (right) photos. Courtesy of Emage Medical (www.EmageMedical.com). Emage Medical Image Pro II, skin pores. Courtesy of Emage Medical (www.EmageMedical.com). The image below shows a summary analysis on a male patient using the Emage Pro I System. Facial Analysis Summary using Emage System. The Mirror medical imaging software has different programs that provide photodocumentation and offer representations of facial changes from facial treatments and surgeries.  .
Canfield Scientific, Inc offers nonportable 3-dimensional imaging of the face and neck with its VECTRA M3, VECTRA XT, and VECTRA WB360 imaging systems. Emage provides the IMAGE Pro 3D. Portable 3-dimensional imaging systems are also available, such as the VECTRA H1 imaging system from Canfield Scientific  and the 3D LifeViz Mini from Quantificare [7, 8] . The 3D LifeViz Mini is the only portable system for 3-dimensional skin analysis, before-and-after comparison, and simulation. Accurate metrics capture the depth of wrinkles and pores and enable the user to visualize and assess the evolution and efficacy of treatment. See the image below. Pore analysis from Quantificare. Courtesy of Quantificare (www.quantificare.com). 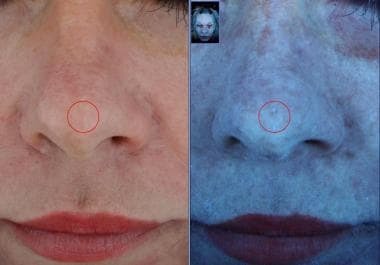 A handheld Wood lamp with an ultraviolet light is a simple way to assess facial pigmentation, [11, 12] as shown in the two images below. 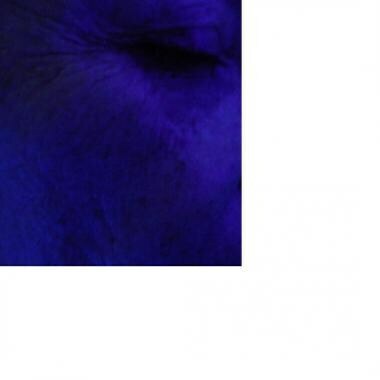 Facial pigmentation viewed with nonmagnified blue light. Ascertaining if the patient has used isotretinoin within 1 year before laser resurfacing is important. Some authors recommend discontinuation of isotretinoin for a minimum of 6 months before resurfacing with the erbium:yttrium-aluminum-garnet (Er:YAG) laser or the carbon dioxide laser. Others recommend waiting at least 1 year or longer. This concern stems from the effect isotretinoin has on the cells that repopulate the laser-treated skin surface. Even fractionated treatment ablates microislands of epithelium while leaving other islands of epithelium intact. The epithelial cells of the adnexal structures are a regenerative source for the re-epithelialization of laser-treated skin. Isotretinoin and radiation exposure destroy these adnexal structures. Facial radiation has been used in the past for the treatment of acne and thyroid gland enlargement. With the fractional laser modalities, regeneration of the epithelium is less of a major concern because small islands of epithelial cells are left intact. Nonablative modalities leave the epithelium with much less and even minimal changes. However, atypical healing can occur with any resurfacing modality, and appropriate caution should be exercised. Differentiation between static and dynamic wrinkles and the degree of rhytidosis must be ascertained and documented before laser resurfacing. Certain aesthetic scenarios require a combination of laser ablation and more invasive and traditional rejuvenative techniques to achieve adequate rhytide reduction. Face or midfacial lifting, forehead or brow elevation, and blepharoplasty may be coupled with resurfacing  and tailored to the patient's needs. This combination of modalities may be performed together or in stages. Safety concerns do exist with traditional carbon dioxide laser resurfacing and full-face–lifting surgery. However, resurfacing can safely be performed in certain scenarios, such as mini lifts. Rhytides exacerbated by active facial muscle contraction are more impervious to laser resurfacing than are static lines (see image below). Crow's feet and lateral smile lines around the eyes are deepened with smiling and can be treated with some success, as evidenced by reduction in wrinkle depth. Botulinum toxin treatment before resurfacing can lessen the mimetic-induced lines and provide a more pleasing aesthetic outcome. Contraction of the frontalis muscle is responsible for the creation of the forehead rhytides depicted here. Laser resurfacing may soften these, but the mimetic muscles are better treated with botulinum toxin injections or forehead elevation and release of the frontalis muscle. 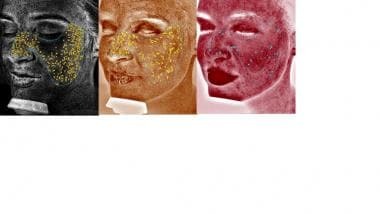 Evaluation of facial skin pigmentation before laser resurfacing is paramount for successful results. Pigment can be inherited ethnically or can be acquired, as in melasma or Addison disease. 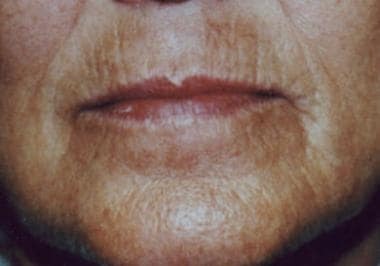 A higher degree of preablative pigmentation increases the risk of hyperpigmentation and hypopigmentation (see image below) after laser resurfacing. The perioral pigmentation depicted here can worsen after laser resurfacing. Hormonal changes during pregnancy can vary the amount of pigmentation, and performing resurfacing on women who are pregnant is contraindicated. The higher the type and the degree of pigmentation, the greater the risk of postinflammatory hyperpigmentation. Persons who have minimal pigmentation or light skin can develop prolonged postoperative erythema but are less likely to develop the pigmentary sequelae. Pretreatment regimens with bleaching agents commonly are used; however, in 1999, West and Alster reported that these pretreatment regimens may not be necessary. However, the standard hydroquinone-based bleaching agents are not without concerns and are not available in all countries. A noted benefit is the marked reduction in recuperative time, allowing patients to be treated and return to work within a shortened period and, in some cases, with no downtime. These modalities and combinations of these different modalities have allowed practitioners to treat a wider array of skin types. Patient acceptance has also increased owing to the ostensible less invasive nature of these modalities, represented by the reduced healing times. However, these modalities continue to evolve, and appropriate patient assessment is always warranted. Many different modalities of facial resurfacing, including but not limited to, laser, nonlaser, ablative, nonablative, sublative, and even chemical peels, are adjuncts in the antiaging treatment spectrum. These technologies can be used separately or in conjunction with other noninvasive and invasive treatments. Regardless of how these techniques are used, the recipient of them must be assessed carefully before treatment can begin. The physician must ascertain the patient's expectations and render a critical and honest judgment as to whether these technologies can deliver the expected results. If the answer is no, or if the expectations are unrealistic, treatment should be deferred and other modalities considered, if applicable. Careful pretreatment analysis is an indisputable necessity in the evaluation and treatment of facial rhytidosis. Canfield Scientific, Inc. VISIA® Specifications. Available at http://www.canfieldsci.com/imaging_systems/facial_systems/VISIA_Complexion_Analysis/VISIA_Specs.html. Accessed: March 25, 2017. Demirli R, Otto P, Viswanathan R,Patwardhan S, Larkey J. RBX™ Technology Overview. Available at http://www.canfieldsci.com/FileLibrary/RBX%20tech%20overview-LoRz1.pdf. Accessed: March 25, 2017. Emage Medical. Image Pro II: Our latest and most powerful Skin Imaging system!!!. Available at http://www.emagemedical.com/image-pro-ii/. Accessed: March 25, 2017. Digitale-Photographie. Available at http://digitale-photographie.info. Accessed: March 25, 2017. Canfield Scientific, Inc. Available at http://www.canfieldsci.com. Accessed: March 25, 2017. Quantificare. Available at http://www.quantificare.com. Accessed: March 25, 2017. Quantificare. 3D LifeViz® Mini. Available at https://www.quantificare.com/portfolio-view/3d-lifeviz-mini/. Accessed: March 25, 2017. Anaface. Available at http://www.anaface.com. Accessed: March 25, 2017. Kashmir Hill. Free computer analysis of your beauty. What's the catch?. www.forbes.com. Available at http://www.forbes.com/sites/kashmirhill/2009/07/01/free-computer-analysis-of-your-beauty-whats-the catch/. Accessed: July 18, 2013. Moskowitz RJ. Wood's lamp examination. MedlinePLus. Available at https://www.nlm.nih.gov/medlineplus/ency/article/003386.htm. December 2, 2014; Accessed: September 13, 2015. Oakley A. Wood lamp skin examination. DermNet NZ. Available at http://dermnetnz.org/procedures/wood-lamp.html. August 2014; Accessed: March 25, 2017. Kotlus BS, Schwarcz RM, Nakra T. Upper Eyelid Fractional CO2 Laser Resurfacing With Incisional Blepharoplasty. Ophthal Plast Reconstr Surg. 2016 Jul-Aug. 32 (4):267-9. [Medline]. Richter AL, Barrera J, Markus RF, Brissett A. Laser skin treatment in non-Caucasian patients. Facial Plast Surg Clin North Am. 2014 Aug. 22 (3):439-46. [Medline]. Fitzpatrick RA. 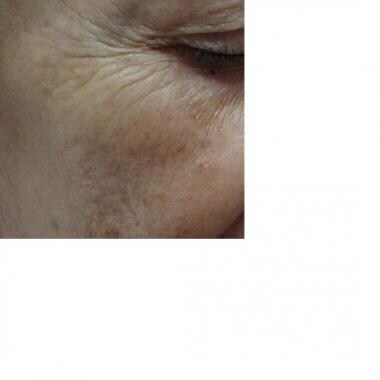 Facial resurfacing with the pulsed carbon dioxide laser. A review. Facial Plast Surg Clin North Am. 1996. 4(2):236. Roberts WE. Skin type classification systems old and new. Dermatol Clin. 2009 Oct. 27(4):529-33, viii. [Medline]. Britt CJ, Marcus B. Energy-Based Facial Rejuvenation: Advances in Diagnosis and Treatment. JAMA Facial Plast Surg. 2017 Jan 1. 19 (1):64-71. [Medline]. [Full Text]. El-Domyati M, El-Ammawi TS, Medhat W, Moawad O, Mahoney MG, Uitto J. Multiple minimally invasive Erbium: Yttrium Aluminum Garnet laser mini-peels for skin rejuvenation: an objective assessment. J Cosmet Dermatol. 2012 Jun. 11(2):122-30. [Medline]. [Full Text]. Cohen JL, Ross EV. Combined fractional ablative and nonablative laser resurfacing treatment: a split-face comparative study. J Drugs Dermatol. 2013 Feb. 12 (2):175-8. [Medline]. Badawi A. Role of lasers in facial rejuvenation. G Ital Dermatol Venereol. 2012 Jun. 147 (3):285-93. [Medline]. Cohen JL, Geronemus R. Safety and Efficacy Evaluation of Pulsed Dye Laser Treatment, CO2 Ablative Fractional Resurfacing, and Combined Treatment for Surgical Scar Clearance. J Drugs Dermatol. 2016 Nov 1. 15 (11):1315-1319. [Medline]. Mercandetti M. Laser-assisted blepharoplasty and laser resurfacing for the treatment of facial rhytids. Textbook of Ophthalmology. Waverly; 2001. 2001. Mercandetti M, Cohen AJ. Complications of facial laser resurfacing. Brazzo B, ed. Pearls and Complications in Ophthalmic Plastic Surgery. 2001.